This new report from Engalco provides information concerning the players, industry dynamics and detailed, highly granular, market forecasts through to year 2017. In the past RF power amplifiers (RFPAs) for cell phone handsets have relied exclusively on GaAs or InGaP-based RFICs. 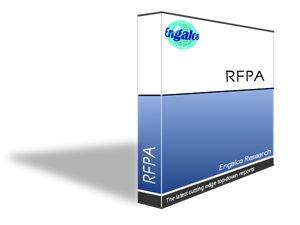 However in recent years RF CMOS RFPA technology has made significant strides and is now strongly impacting the territory that was previously the exclusive domain of GaAs or InGaP technology. This new report from Engalco provides information concerning the players, industry dynamics and detailed, highly granular, market forecasts through to year 2017. Details are provided of the global and regional markets – regional meaning Europe, North America and the “Rest of the World”. Total available market values (TAMs) are presented in US$M. In this new report conservative, median and optimistic forecasts are presented for (i) GaAs (or InGaP) RFPAs and (ii) RF CMOS RFPAs into both basic handsets and smartphones. The players that have fabless operations are identified and the entire industry structure is critiqued in detail. Amongst the RF CMOS RFPA players: Amalfi Semiconductor, Black Sand, Javelin Semiconductor, RFaxis and Qualcomm. Amalfi has shipped well over 100M units, Javelin has new contracts and Qualcomm have recently announced their penta-band RF CMOS PA. In 2012 the total production shipments of CMOS-based RFPAs into basic handsets well-exceeded 3B units but this is forecasted to fall by almost two-thirds to just over 1B units in 2017. Contrastingly, shipments into smartphones will start with approximately 2M units being sold in 2012 but will increase dramatically to reach 432M in 2017. Currently all GaAs and InGaP-based RFPAs go into smartphones and we expect this situation will continue. Major players include: Anadigics, Avago Semiconductor, Skyworks and TriQuint. Production shipments were just under 2B units in 2012 and are forecasted to decrease steadily to 918M in 2017. In both cases the falls in production shipments are caused mainly by an important shift to single-chip broadband (multi-band) RFPAs in the very near future. However, these new RFPAs will enter the markets with considerably higher unit prices than current narrow-band amplifiers. The details and dynamics are described in the report.